After yesterday’s attempt at quantification revealed insufficient dilution of the libraries, I repeated the qPCRs using 1:100000 dilutions of each of the libraries. 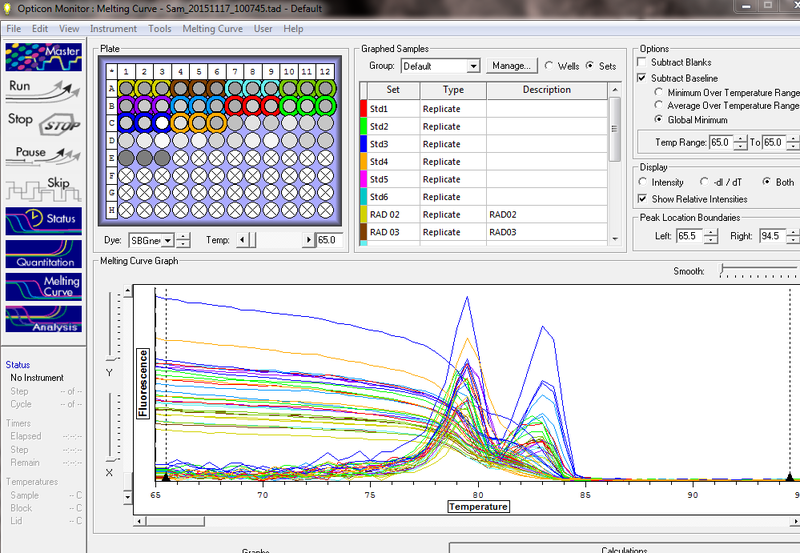 Used the KAPA Illumina Quantification Kit (KAPA Biosystems) according to the manufacturer’s protocol. Made 1:100000 dilutions of each library were made with NanoPure H2O. Ran all samples, including standards, in triplicate on the Roberts Lab Opticon2 (BioRad). Overall, the new dilutions worked well, with all the library samples coming up between Ct 9 – 15, which is well within the range of the standard curve. 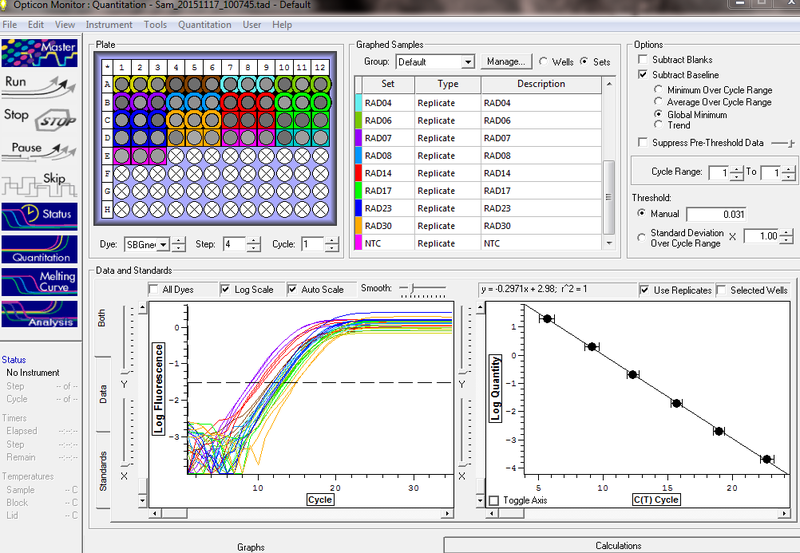 Manually adjusted the baseline threshold to be above any background fluorescence (see images below). 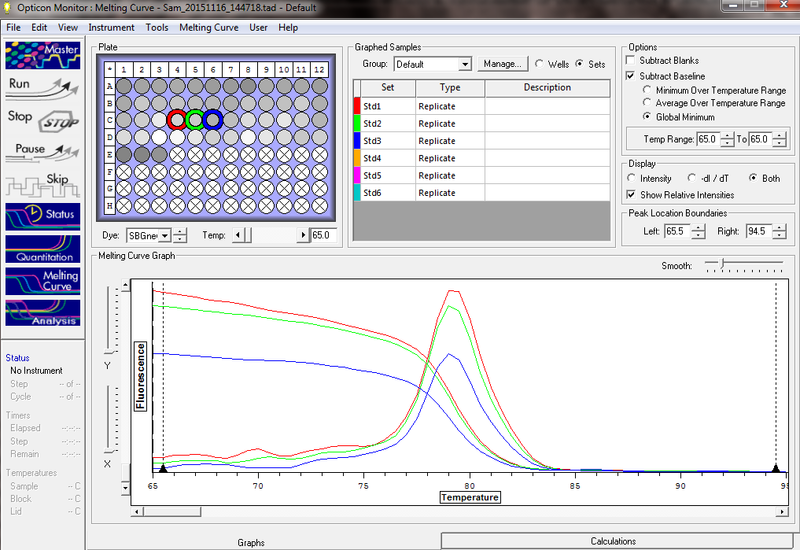 All samples, except Oly RAD 30, exhibit two peaks in the melt curve indicating contaminating primer dimers. Additionally, the peak heights appear to be roughly equivalent. Can we use this fact to effectively “halve” the concentration of our sample to make a rough estimate of library-only PCR products? This entry was posted in 2bRAD Library Tests for Sequencing at Genewiz, Olympia oyster reciprocal transplant and tagged 2bRAD, KAPA Library Illumina Quantification Kit, olympia oyster, Opticon, Opticon2, Ostrea lurida, qPCR, rad, RAD-seq on 17 November, 2015 by kubu4. The final step before sequencing these 2bRAD libraries is to quantify them. 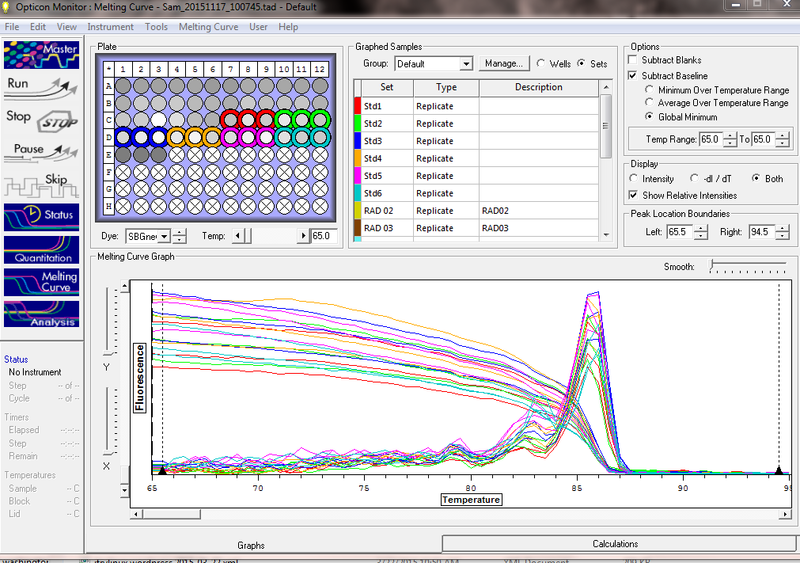 Used the KAPA Illumina Quantification Kit (KAPA Biosystems) according to the manufacturer’s protocol. Made 1:4 dilutions of each library to use as template. The amplification plots that are pushed up against the left side of the graph (essentially at ~ cycle 1) are all of the libraries. A 1:4 dilution was insufficient to have the libraries amplify within the range of the standard curve. All libraries except one (Oly RAD Library 30) have detectable levels of primer dimer. This confounds library quantification (because both the intended PCR product and the primer dimers contribute to the fluorescence accumulation), as well as potentially interfering with the subsequent Illumina sequencing (primer dimers will be sequenced and contain no insert sequence). Will repeat the qPCR with more appropriately diluted libraries. See the info below for more deets on this run. This entry was posted in 2bRAD Library Tests for Sequencing at Genewiz, Olympia oyster reciprocal transplant and tagged 2bRAD, KAPA Library Illumina Quantification Kit, olympia oyster, Opticon, Opticon2, Ostrea lurida, qPCR, rad, RAD-seq on 16 November, 2015 by kubu4. Jake and Steven recently noticed localized “hot spots” on most of Jake’s recent qPCRs, where higher levels of fluorescence were consistently showing up in interior portions of the plates than the outer portion of the plates. Ordered 5nmol of 6-FAM T10 Calibration Standard from Biosearch Technologies and resuspended it in 50μL of 1x dilution buffer (10mM Tris-HCl pH8.0, 50mM NaCl, 5mM MgCl2) to make a 100μM solution. Buffer and dye were stored @ -20C after use. Made a working dilution of the 6-FAM dye of 300nM in 5mL of 1x dilution buffer (15uL of 100uM dye in 5mL of buffer). Ran the calibration protocol on the Opticon2 (BioRad) using 50μL of dye in all wells when required by the calibration protocol. Empty Plate – Ratio of Channel 1 to Channel 2 voltage measurements. The empty plate measurements above show the expected low voltage measurements, but also show a ~5-fold difference in min/max voltages in each channel. Additionally, the voltage ratios (the third image above) show a wavy pattern, but a smooth, even level from well-to-well is what would be expected if the Opticon was in measuring things properly. Dye Measurements – Channel 1 to Channel 2 voltage measurement ratios. The voltages measured in each channel show the expected increase in voltages relative to the empty plate (> 10x voltage than empty plate). However, the spread between the min/max voltages in both channels is ~4-fold. Additionally, the ratio between the two channels still shows the wavy pattern across all the wells instead of the expected even ratio from well-to-well that should result from the calibration. It appears the calibration has not resolved the issue. To verify that calibration has failed, I ran two sets of qPCR “protocols” that simply read the dye plate to measure fluorescence across the plate in two plate orientations. First thing to notice is that there’s clearly uneven fluorescence detection across the plate. Viewing the images that also contain the fluorescence graphs reveals a spread of ~8-fold between the highest and lowest fluorescence detection. The second thing to notice is that, despite rotating the plate 180 degrees, the rotation has no effect on the fluorescence detected in each block location. Both of these taken together provide strong evidence that there’s an issue with the machine. This entry was posted in Miscellaneous and tagged calibration, FAM, Opticon, Opticon2, qPCR, troubleshooting on 30 June, 2015 by kubu4. Reran these four samples to obtain a definitive answer as to whether or not they have residual gDNA in them prior to using them to make cDNA. No amplification in any of the RNA samples, nor the NTCs. Will make cDNA. This entry was posted in Miscellaneous and tagged actin, DNased RNA, olympia oyster, Opticon, Opticon2, Ostrea lurida, qPCR, SR ID: 1504, SR ID: 1505, SsoFast EvaGreen Supermix on 21 May, 2015 by kubu4. Positive control samples are the only samples that produced amplification (cycle ~20). Will proceed to making cDNA. This entry was posted in Miscellaneous and tagged actin, ctenidia, DNased RNA, gill, olympia oyster, Opticon, Opticon2, Ostrea lurida, qPCR, SR ID: 1504, SR ID: 1505, SsoFast EvaGreen Supermix on 14 May, 2015 by kubu4. Ran qPCRs on the O.lurida total RNA I isolated on 20150506 to assess presence of gDNA carryover with Oly Actin primers (SR IDs: 1505, 1504). Excluding the no template controls (NTC), all samples produced amplification. Will require DNasing before making cDNA. Related to the qPCR I ran earlier today with these same primers, the efficiencies of the reactions on this plate are significantly better (i.e. 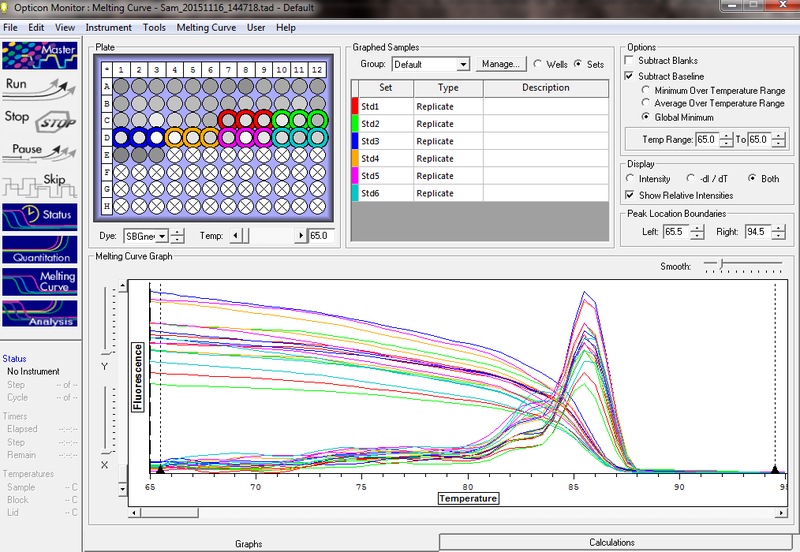 normal; >80% efficiencies) than the earlier qPCR. The improved efficiency would also explain why the positive control comes up two cycles earlier on this run. In the amplification plots below, the positive control reps are the two lines coming up at cycle ~20. This entry was posted in Miscellaneous and tagged actin, ctenidia, gill, heat shock, olympia oyster, Opticon2, Ostrea lurida, qPCR, RNA, SR ID: 1504, SR ID: 1505 on 12 May, 2015 by kubu4. Ran qPCRs on the O.lurida total RNA I isolated on 20150507 to assess presence of gDNA carryover with Oly Actin primers (SR IDs: 1505, 1504). On a side note, it should be noted that the efficiencies for all of the reactions were pretty bad; probably averaging 50%. Not entirely sure why or what that indicates. In the amplification plots below, the positive control reps are the two red lines coming up at cycle ~22. This entry was posted in Miscellaneous and tagged actin, ctenidia, gill, olympia oyster, Opticon2, Ostrea lurida, qPCR, RNA, SR ID: 1504, SR ID: 1505 on 12 May, 2015 by kubu4. 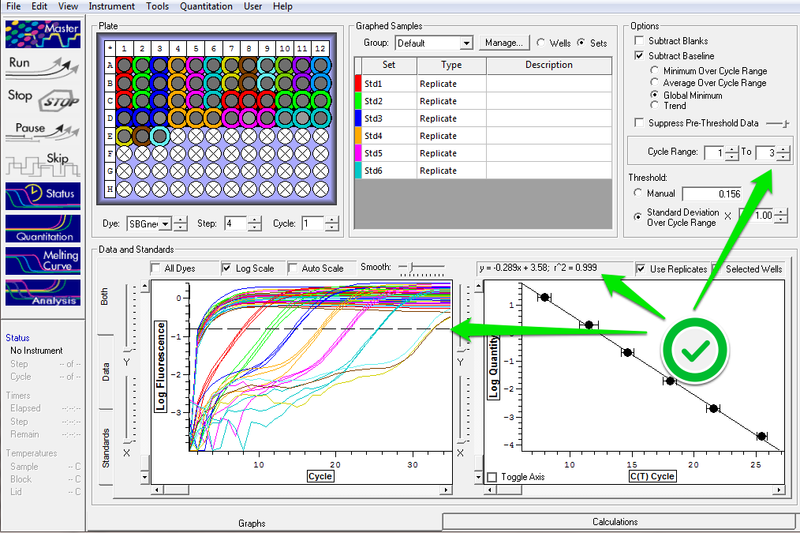 Cycling params can be found in the qPCR Data File (see Results). High levels of initial fluorescence are present in both sets of cDNA samples, while the NTC sample does not exhibit this behavior, suggesting the template is to blame. Have suggested to Halley to make new cDNA using the correct recipe, instead of the FISH441 recipe she had been using. 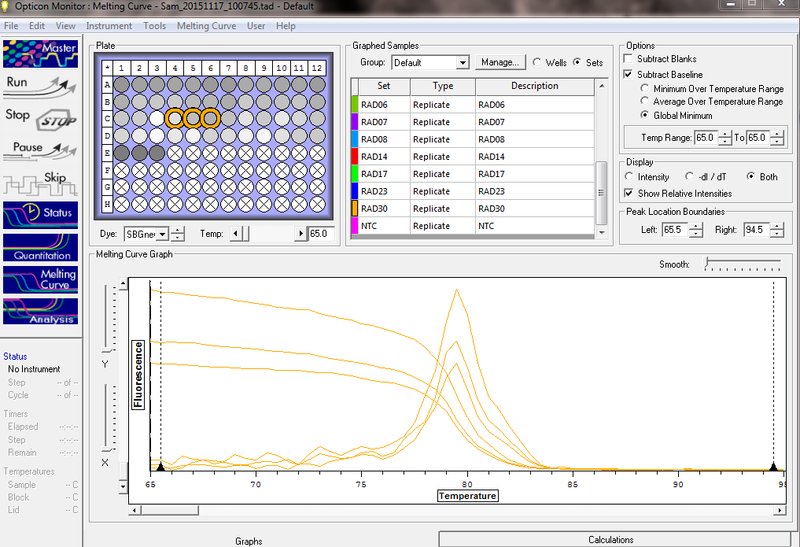 This entry was posted in Miscellaneous and tagged Opticon2, qPCR on 28 November, 2012 by kubu4. 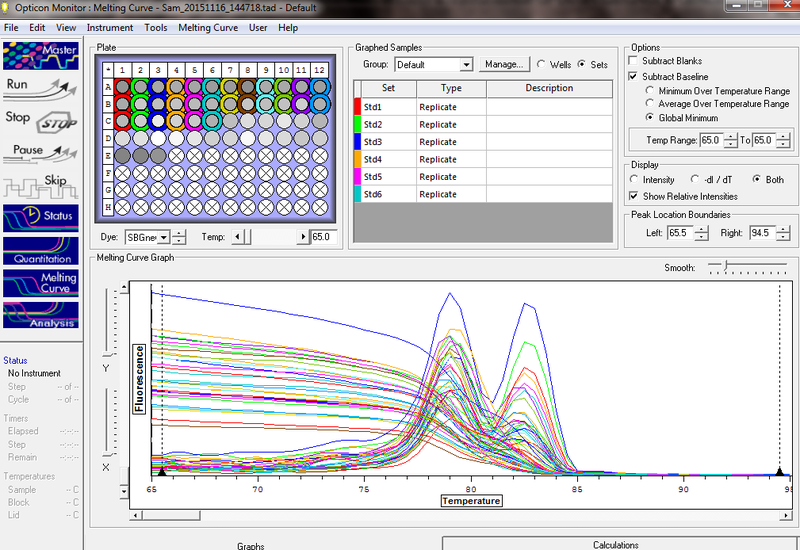 Ran qPCR on manila clam larvae cDNA that Dave made on 8/7/2012, using the sample sets from 7/29/2011 and 8/5/2011 of the OA manila clam experiment he ran. 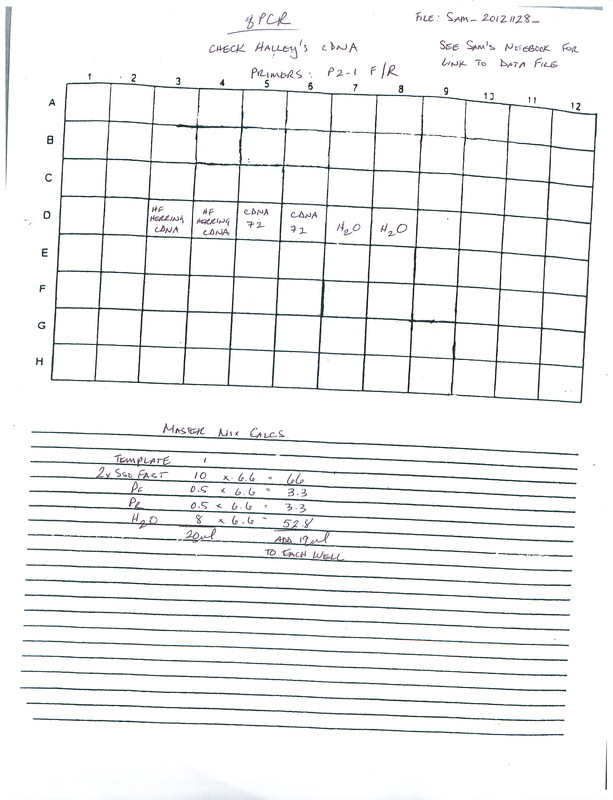 Primers were verified to be in good working order by Dave on 4/1/2012 (see Dave’s notebook). Master mix calcs are here. 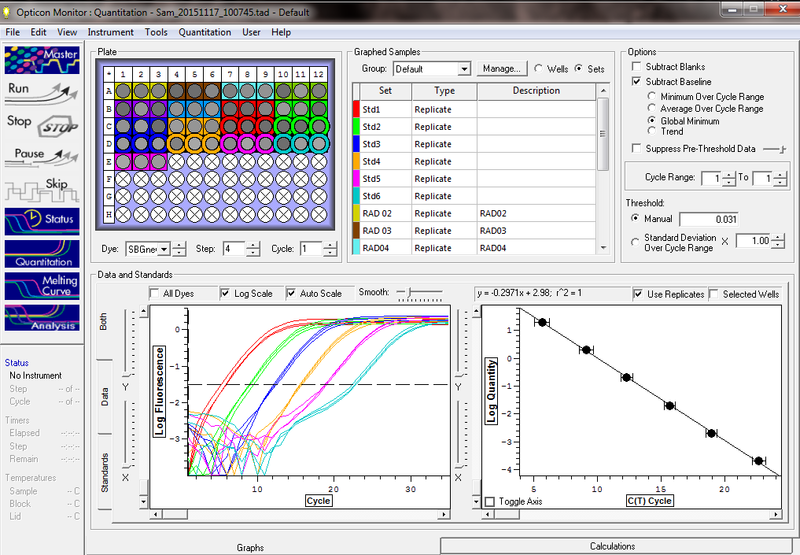 Cycling params can be found in the qPCR Data File (see Results). 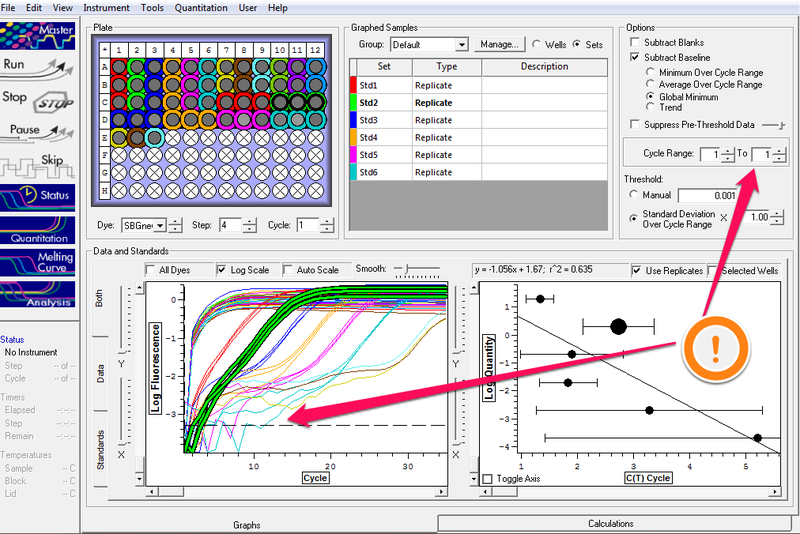 Plate layout and PCR Miner analysis can be found in the qPCR Raw Data file (see Results). All samples run in duplicate. Reps look pretty good, although the 4C2 8.5.11 sample has consistently bad reps across all of today’s runs. Data will be shared with Steven for comparison to Dave’s Illumina data. All data was normalized to EF1a expression from this run. This entry was posted in Miscellaneous and tagged cathepsin, EF1a, Manila clam, Opticon2, PCR Miner, qPCR, Venerupis philippinarum on 8 November, 2012 by kubu4.